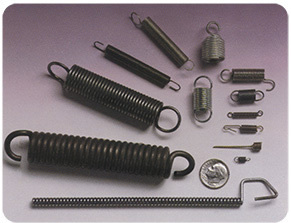 Diversified Spring Technologies, Inc. - Extension Springs - compression springs, cable springs, extension springs, torsion/specialty springs, wireforms, rings and washers, fourslide products, assemblies and stampings, prototypes. Extension springs exert a pulling force. They can be close or open wound, with ends formed to allow resistance. Extension springs can have a wide variety of hooked and looped ends for the use of attachment to other parts in an assembly. 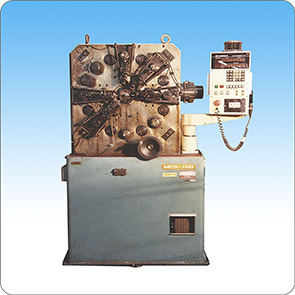 Diversified Spring Technologies can help in the design of the extension spring. Extension springs can be formed using various materials, such as standard carbon and stainless steels, elgiloy, and inconel. Diversified Spring Technologies specializes in forming extension springs with the capability to coil wire sizes ranging from .006” to .313”. However, in our Short-Run Department we can go over .500” wire diameter. Our Engineering Department offers a variety of services ranging from engineering support, design, and prototypes. We also offer special packaging and color-coding for your parts.